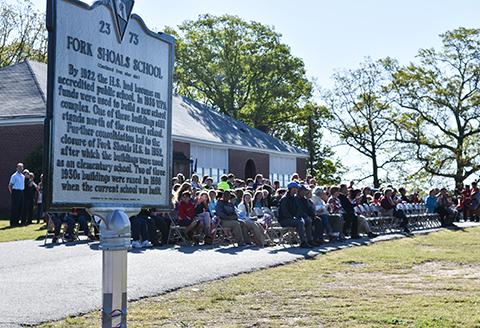 A special dedication ceremony paying tribute to the historic Fork Shoals School and unveiling of a marker was held Thursday morning April 7 at 9 a.m. in front of the old school. Fork Shoals School was established in 1877 on the grounds of the current Fork Shoals Baptist Church. It is the oldest school in Greenville County. 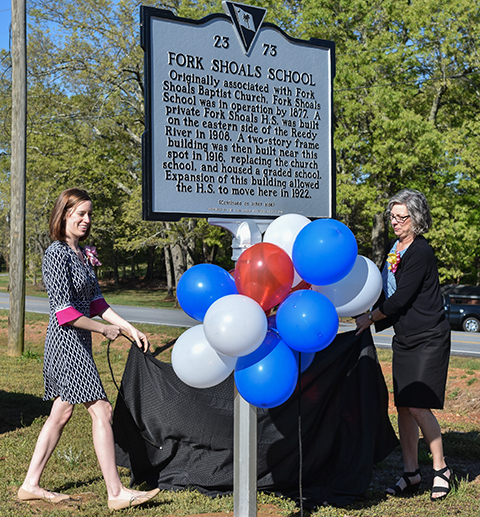 The Fork Shoals Historical Society, representatives of Fork Shoals School and the surrounding community held a special dedication ceremony Apr. 7 for a marker designating Fork Shoals School as an historic landmark. The South Carolina Department of Archives and History recently designated Fork Shoals School, which was established in 1877, as an historic landmark. 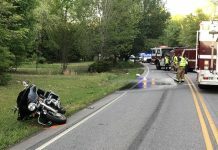 The school is the oldest in Greenville County and is located at 916 McKelvey Rd., on the grounds of the current Fork Shoals Baptist Church. 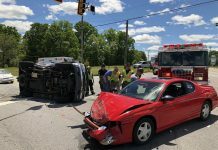 The dedication ceremony program included former Fork Shoals School prinicpals and alumna, representatives of Greenville County Schools, Greenville County Council, Fork Shoals School, Fork Shoals Historical Society, Ralph Candler Middle School Orchestra, Woodmont JROTC and others. Major Robert Bouldin and the Woodmont High School JROTC Color Guard opened the program. The JROTC Color Guard includes James Rogers, Devan Stone, Josh Hawthorne, Jacob Marlow, Austin Cook and Madison Barnell. Woodmont High and Fine Arts Center student Ally McCaslin sang the National Anthem. Kim Reid, Fork Shoals School principal welcomed guests. Speakers included Anne Peden, PhD. Chair of the Greenville County Historic Pereservation Commissionand Vice Chair of the Fork Shoals Historical Society Board and Greenville County Council District 26 Representative Lynn Ballard. History of Fork Shoals School was read by Fork Shoals School fifth graders Brady Coleman and Mia Wills. Ni’jah Simpson presented text on the Fork Shaols School Historical Marker. Music was presented by Ralph Candler Middle School Full Orchestra, conducted by Susan Wines. Unveiling the marker was Sara Lyn King and Maggie King, daughter and Granddaughter of G. Lafoy Woods, Fork Shoals High School Principal from 1949-1952. Maggie King, fifth grade teacher at Fork Shoals School, left, and Sara Lyn King unveil the historic marker designating the school as a historic landmark by The South Carolina Department of Archives and History.